As an empowered and confident woman, my passion and vision is to assist women of all ages, shapes and sizes to overcome their fears and limitations, to discover their authentic selves and their inner strength so that they can fall in love with themselves and live an AWESOME and FULFILLING life!!! I get a great sense of fulfillment in helping people develop love, trust and respect for themselves, create positive change, identify their desires, and live the life they dream of. A life that is filled with confidence, love, happiness, self-respect and self-worth. All of which are of the utmost importance and essential to a woman’s overall emotional health and well-being. My love for life and many unique experiences have allowed me to grow into a grateful, fun-loving, happy person who is confident, adventurous, goal-oriented and ambitious. Others have described me as being an enthusiastic and high-energy leader, who is very empathic, authentic, sincere, intuitive, inspirational, generous, trustworthy and great with people. I live my life continuously pushing myself out of my comfort zone, facing my fears and constantly taking action. I am passionate about life and I live my daily life engaged in activities requiring absolute confidence. I not only teach confidence, I LIVE IT! One evening while out with a group of my girlfriends they all told me: "You should get paid for making women feel good about themselves, it's so easy for you and you are always making us feel so confident." The wheels started turning and the idea to start my own business as a Confidence Coach was born. I was employed full time, travelling extensively across Western Canada, and spent all my spare time researching and writing like crazy. I was unsure how I was actually going to start this unique business but I knew and believed with my entire heart and soul, that this was my purpose in life. I had a huge desire to start my business, and inspire and empower women all over the world. I always believed that women need to learn about authentic confidence, and I was someone who could do it. I have experienced the pain of not believing in myself, not standing up for myself and feeling helpless and fearful. As a young 12 year old girl in Grade 8, just beginning my high school years, I was bullied. I remember being so scared to go to school for the first 2 years –there were many days I would pretend to be sick so my Mom would let me stay home. There were girls that were in my own grade, and the next grade, that would constantly make fun of me, laugh at me, torment me, threaten to beat me and embarrass me in front of other kids. They were relentless, and I was riddled with fear most of the time. I hated going to school. On top of all the bullying, I had a negative body image. I had grown very quickly in Grade 9. I was 5'10 at 15 years old, taller than most of the other kids and a lot of the teachers. As a result of growing so fast, I suffered from harsh growing pains in my ankles and legs that were so painful. There were many nights, I was awake in agony and had to wake my Mom up to help me deal with the pain. In Grade 10, I saw ad for a basic modeling/self improvement course at the local leisure center, and my Mom enrolled me in it. That course helped me a lot! I learned to like myself a lot more, appreciate my body more and to be more confident in the way I carried myself. So from that point on, I was aware of the importance of self-love and embracing the person you are. I dreamed of becoming a model and a year later, I was doing it! Fast forward to my adult life --in 2008, after suffering a devastating knee injury while on holidays in Mexico, I was forced into unexpected downtime requiring time off work, which ultimately resulted in the loss of my "dream job.” Suddenly I was going through the worst time in my life. I was single, my left leg was in an immobilizer brace, I was on crutches, unable to drive, unemployed and overwhelmed with feelings of helplessness and despair. I quickly learned who my true friends were, and they were few. I spent a while feeling incredibly sorry for myself, being cooped up in my house while I waited for what seemed like a lifetime for my reconstructive knee surgery. (In reality it was a four month wait...and then another six months of healing and recovery after the surgery. This was absolute torture for me! I am a very active person who does not sit around watching TV or enjoy being inside) I gained weight, I felt terrible about myself and my life. My self-esteem and self-confidence was at an all time low. Then one day, while I was really busy sitting on my couch feeling sorry for myself, I had an epiphany. I realized that I was creating my unhappiness. I was choosing to be miserable and choosing to focus on the past. So, I made a conscious decision. I decided to take responsibility for my life and my happiness. I broke my own knee. And I had the ability to make other decisions. I could be sad or I could get happy. I could have very easily chosen to continue to wallow in self-pity, but I knew that it wasn’t getting me anywhere. Instead, I chose to learn from the experience, create positive change and move forward. As a result, I chose to start working on the business idea I had put on the back burner. I had already done a lot of research, accumulated tons of information, done a lot of writing over the previous couple of years, and all of a sudden I had nothing but time to develop an exciting and unique business as a Confidence Coach. As is everything, having gone through this experience was such a gift. I was given the opportunity to learn many invaluable lessons that I may not have learned otherwise, as well as being given the time to start my business. I wake up every single day so thankful to be able to do EXACTLY what I was put on this planet to do. 1) All of the women I spoke with agreed that regardless of their age, race, appearance, or level of success, they could use some help improving their self-confidence and self-esteem. 2) I repeatedly heard people saying that this unusual business would not be successful: “I’ve never heard of a Confidence Coach, what the heck is that?” But I always REALLY believed in my business idea and never let anyone else’s opinions or judgments deter me from achieving my goals. My abilities stem from years of helping both women and men build their confidence. In addition to having trained with the very highly regarded Erickson College International, I have coached, advised and motivated people of all ages and backgrounds. I have an innate ability to identify and understand problems, to communicate effectively and to assist in problem solving and goal setting. Being the daughter of amazing parents (an ambitious, entrepreneurial Mom and a hardworking, happy-go-lucky Dad) has instilled in me the importance of having very strong morals, work ethics and a sense of self at a young age. I have worked as a producer, a reporter, an event planner, a marketing and promotions supervisor, a fashion show producer, a fashion and spokes model and also owned my own business at a young age. I have been a keynote speaker at trade shows and events and I am a published writer. I was also selected to be on CBC's "The Dragons' Den" for my other business High Heel Appeal --you can check out my experience HERE I have produced a unique instructional high heel DVD which is the first DVD of its kind, teaching people how to boost their confidence – and their height – with a pair of high heels. I am a proud volunteer with Big Sisters™ and a Community Leader with The Minerva Foundation's Learning to Lead™ Program. To learn more about my success with Absolute Confidence and High Heel Appeal, you can visit my “In The Spotlight” page. There have been times in my life where I too have struggled with my confidence. I have gone through very difficult, challenging, upsetting and frustrating times. I was able to overcome them, learn from the experiences and am so grateful for having gone through each of them. 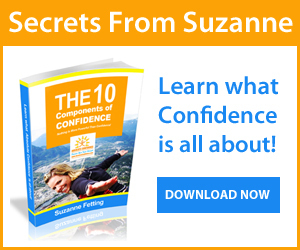 I have written a book called “The 10 Components of Confidence” and is available for purchase as an e-book. 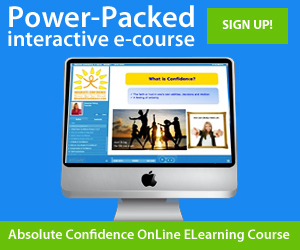 I also have created the Absolute Confidence E-Course: Absolute Confidence Online E-Learning. A highly informative, power-packed interactive e-course providing extensive knowledge, tools and exercises needed to build your ‘absolute confidence' from the privacy and comforts of your own home. I would sincerely like to pass along to you what I have learned about the significance of having authentic and absolute confidence and self-respect. As well as sharing with you all of the skills, tools, tips, techniques and exercises I have developed over the years. As your Confidence Coach, I will set you on the right path to achieve your ultimate goals! If you’re thinking about Confidence Coaching, please feel free to call or email me to discuss the different packages I offer. I would love to help you discover your inner strength and learn how amazing you are and how happy and confident you can become! I will help you achieve the confidence and success you want. If you are ready to create REAL and LASTING positive change in your life and become the confident you, contact me today! You don’t have to live in the same city or country to have me as your Confidence Coach. I am able to work with clients from anywhere in the world over-the-phone and internet with Skype.